Providing specialized and independent project support for owners, operators, designers and producers in themed entertainment. We will help you navigate the Experience Industry. Call on the GW Group to guide and assist you through the creation of an outstanding, experiential guest experience for your museum, theme park, heritage center, science center, visitor center, themed retail, expo pavilion, FEC, planetarium or other visitor attraction. GW Group is headed by George Wiktor, who has 25 years' experience working with top companies in production and project management, on both the creative and the business side. George Wiktor, director of attraction management at Hero Ventures, to play a creative role developing "The Marvel Experience"
George Wiktor announced his new role as Director of Project Management at Hero Ventures, which is developing "The Marvel Experience" 4D touring attraction in collaboration with Marvel Entertainment. Read about the project in The Hollywood Reporter at this link. See the official press release, below. August 22, 2013, Los Angeles, CA – Hero Ventures, a Los Angeles based entertainment company, announced today that it is teaming up with Marvel Entertainment to create “The Marvel Experience,” an innovative, traveling experience, featuring dozens of Marvel’s iconic Super Heroes. This attraction will appeal to a multi-generational audience and will leverage state-of-the-art interactive and multimedia technology, including a 4D motion ride and original 3D animated features, allowing fans to be a part of the action. The tour comes to life in 2014. Founded by sports and entertainment industry entrepreneurs Rick Licht and Doug Schaer, Hero Ventures is dedicated to producing unique themed entertainment experiences. Solidifying the management team are Michael Cohl, former Live Nation Chairman and legendary live event impresario, along with his Spider-Man: Turn Off The Dark co-producer and PRG founder Jeremiah “Jere” Harris, who will serve as lead producers. The team is rounded out by co-founding partner Jason Rosen. Initial “A” round investors include Oscar winning film producer and co-owner of the NFL’s New York Giants, Steve Tisch; Roy P. Disney and Shamrock Holdings; Guess Jeans co-Founders Maurice & Paul Marciano; WWE®; Vista Equity Partners President Brian Sheth; Ross Hilton Kemper and Enlight Media, among others. In addition, Tisch, Shamrock’s Stanley Gold, Maurice Marciano, WWE’s Basil V. DeVito, Jr. and Enlight’s David B. Miller will serve alongside Licht, Schaer, Cohl and Harris on Hero Ventures Board of Directors. The Marvel Experience is a “first-person” Super Hero adventure in which audiences step into the Marvel Universe to become a part of the story and the action. Innovative tour elements include a one-of-a-kind, traveling dome complex the size of two football fields developed exclusively by Hero Ventures. In addition to the 4D motion ride and 3D animated features, other components will include digitally projected animation, motion-comic origin stories, virtual reality and holographic simulations, original merchandise and integrated social media touch points all carefully woven into the rich narrative story line. “Hero Ventures is developing a themed entertainment concept that we expect will be a transformative, traveling destination that will deliver to fans and families an exciting, groundbreaking and unique experience,” says Marvel’s VP of Business Development, Sean Haran. The characters and stories of the Marvel Universe are beloved around the world by ages young and old as seen with the recent global box office records for Marvel’s The Avengers and Marvel’s Iron Man 3. Among the creative visionaries behind this $30+ million production is an elite team of creative award winners of Oscars, Emmys, CLIOs, Thea Awards and other technical and animation awards to their collective credit. The law firm of Sklar Kirsh served as corporate counsel for Hero Ventures. At the IMERSA 2013 Fulldome Summit in Denver (Feb 14-17), George Wiktor of The GW Group joins the panel discussion, “Playing Together under the Dome,” addressing the creative potential of digital dome cinema. Wiktor, a past president of the Themed Entertainment Association (TEA), is an accomplished producer of media-based attractions that employ storytelling to educate and entertain at museums, world expos and amusement parks. Wiktor will take part in the panel discussion “Playing Together under the Dome,” which will examine how fulldome can leverage common ground between intersecting industries in digital multimedia. The discussion will be moderated by IMERSA Board member Michael Daut of Evans & Sutherland. Registration and more information on the 2013 IMERSA Summit are at www.imersa.org. Joining George Wiktor and Michael Daut on the “Playing Together under the Dome” panel discussion at IMERSA Summit 2013 are Dr Jeffrey Kirsch, executive director at the Reuben H. Fleet Science Center; Thomas Kraupe, director of Planetarium Hamburg and producer Jay Williams of Super 78 – participating respectively on behalf of the Giant Screen Cinema Association (GSCA), the International Planetarium Society (IPS) and the Producers Guild of America (PGA). IMERSA has, since its founding in 2008, made a point of cultivating synergy with affiliate business communities and organizations. Throughout a career that began in the 1980s, working with such design companies as BRC Imagination Arts, The Hettema Group and now his own firm, The GW Group, George Wiktor has operated somewhere on the bleeding edge of experiential storytelling - mostly for world expos, museums and corporate visitor centers – learning to combine media, technology and architecture in ever-more seamless ways that are today taken for granted as a benchmark of quality attractions. He served as president of the Themed Entertainment Association, and continues to play an advisory role within TEA. His award-honored projects include: Barnas Brannstasjon [Children’s Fire Station] at Kongeparken, Norway (Thea Award, 2012); “Beyond All Boundaries,” National World War II Museum, New Orleans (Thea Award, 2010); Volkswagen Glaserne Manufaktur, Dresden (Thea Award, 2002); and “World Song” for the USA Pavilion at Seville Expo 92. "Innovations in Immersive Storytelling" is the theme of the IMERSA Fulldome Summit, 14-17 February at the Denver Museum of Nature & Science. The event is attended by operators, content creators and distributors, producers and vendors serving planetariums, giant screen cinema and themed attractions - all converging markets because of digital cinema. The Denver Museum of Nature & Science will be the setting for the annual IMERSA Summit, preceded by two and a half days of fulldome (digital dome video) professional development sessions. Areas of focus will include sound design and audio, cross-platforming from fulldome to giant screen and vice versa, designing a fulldome curriculum in schools, scripting and story for fulldome shows, and setting up fulldome theaters as multipurpose spaces. There will be a series of curated screenings, a Fulldome Innovation Salon for networking, product demonstrations and content sharing and a Creative Video Lab. More information: www.imersa.org/summit. SATE is the annual Experience Design conference of the Themed Entertainment Association. 19-21 September at Disneyland Paris, SATE 2012 addresses "Cultural diversity in Themed Entertainment: Obstacle or Opportunity?" Yves Pépin & Joe Rohde co-chair. Join an open discussion centered on the ideas, trends and questions that have emerged from the previous SATE2012 sessions, and how those concepts can be taken forward into the future of the industry. The conversation will be facilitated by TEA past president George Wiktor of the GW Group. Throughout the conference, George will be working to capture important thoughts and remarks, which will be shared on the TEA_SATE Twitter feed to help inform the conversation. Partagez votre point de vue en participant aux échanges menées autour des principales idées, tendances et questions posées tout au long des sessions de SATE 2012. Au cours de la séance de synthèse, nous identifierons ons les concepts qui émergent et évaluons leur potentiel et leur capacité à changer les paramètres de notre secteur dans l’avenir. Cet exercice de synthèse sera animé par George Viktor du groupe GW, un des anciens présidents de TEA. Pour cette édition, Georges s’attachera à recueillir les idées et remarques innovantes. Il les partagera ensuite avec nous via le TEA_SATE Twitter, afin de nourrir nos propres réflexions et nous permettre de faire un travail de synthèse transversal. More information about SATE 2012, including registration, program and complete speaker list, is available at this link. George Wiktor is a creative producer with over twenty five years experience in developing and producing places that entertain, inform and thrill the public. While navigating the convergence of theater, architecture and media, George has been instrumental in the creation of world-class projects such as museums, corporate information centers, world’s fair pavilions and theme park attractions. Prior to founding the GW Group, George was senior producer at The Hettema Group, an experiential design and production firm. While at THG his projects included the Russian Jewish Museum in Moscow, Russia; The National WWII Museum Theater presentation in New Orleans and several major projects in the Middle East. And for 18 years prior to that, George was a principal at BRC Imagination Arts where he lead the creative development and production of major projects for entertainment companies, museums and corporations including Disney, Warner Bros, Volkswagen, Toshiba and NASA. George Wiktor is an active member of the Academy of Motion Picture Arts and Sciences and also a past President of the TEA, an international organization representing the creators of attractions, places and events. 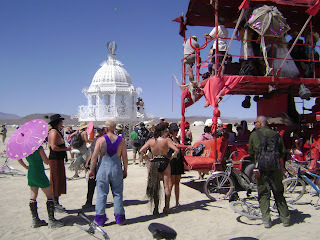 Photos: George Wiktor and Burning Man. (c) all rights reserved. 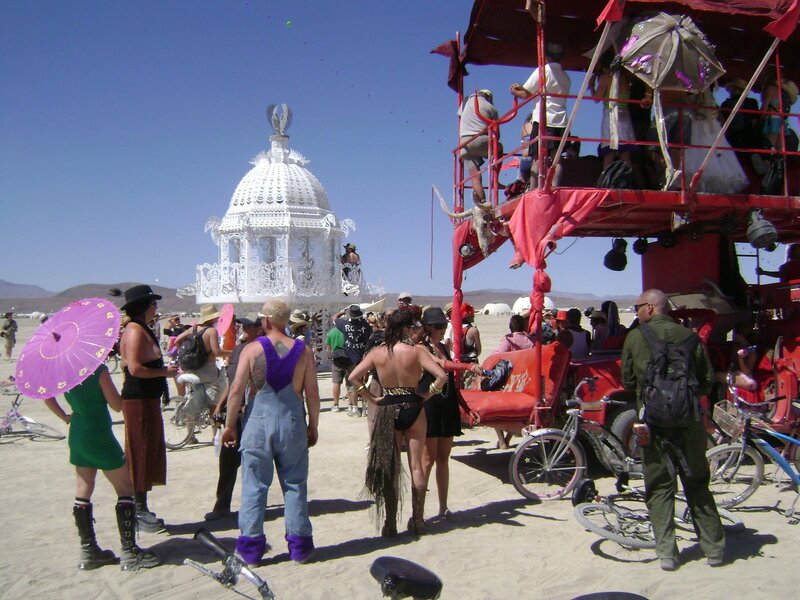 "Seen first-hand, Burning Man turns out to be a highly structured, well-organized, law abiding, civil society: A society that encourages self expression and self reliance in an incredibly inhospitable physical environment. Commercial activity is prohibited and, refreshingly, there are no corporate sponsors. The place operates on gifting with no expectation of return. 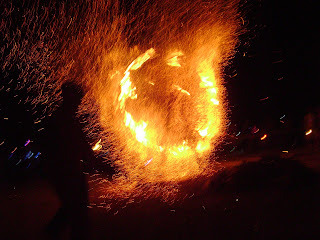 "And most importantly, participation is the key to the success of this event because participation is a form of gifting. Everyone is focused on adding to the success of everyone else’s experience. Whether it be creating an art installation, volunteering in the café, building a lounge in your camp, or providing entertainment for everyone, all the participants add to the overall experience. "Who knows where the participation will lead?" Read the complete article on the InPark Editors' Blog. The September 2011 issue of Park World magazine includes an article about the new Barnas Brannstasjon (Children's Fire Station) attraction that opened this year at Kongeparken in Stavanger, Norway and was very successful in its first season. "We used five years of research on this project," reveals Kongeparken owner Haakon Lund. "...we wanted to make the next generation of immersive experience, in line with our park's six values: learn, play, share, explore, magic and excitement." The GW Group is proud to have been part of this project as consultant and special effects producer. 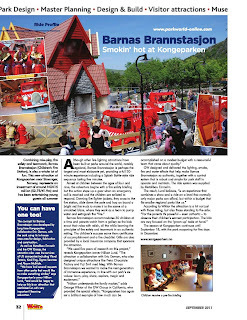 Los Angeles, USA, 17 August 2011 – The GW Group produced a complement of special effects for Barnas Brannstasjon (Children’s Fire Station), the newest attraction at regional theme park Kongeparken, in Stavanger, Norway. Barnas Brannstasjon immerses children ages 4-9 in meaningful role-play while teaching principles of fire safety and teamwork in an authentic setting. The attraction opened for the 2011 season. It was completed on a budget of $2.75 million. 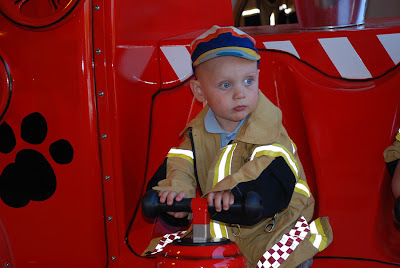 The 20-minute experience begins as a home fire safety briefing that quickly becomes an adventure when a fire emergency call is received and the young park visitors are enlisted to respond. They run across the bridge to the fire station, don firefighter jackets, slide down the pole and then board bright red trucks that rush them to the scene of a simulated fire. 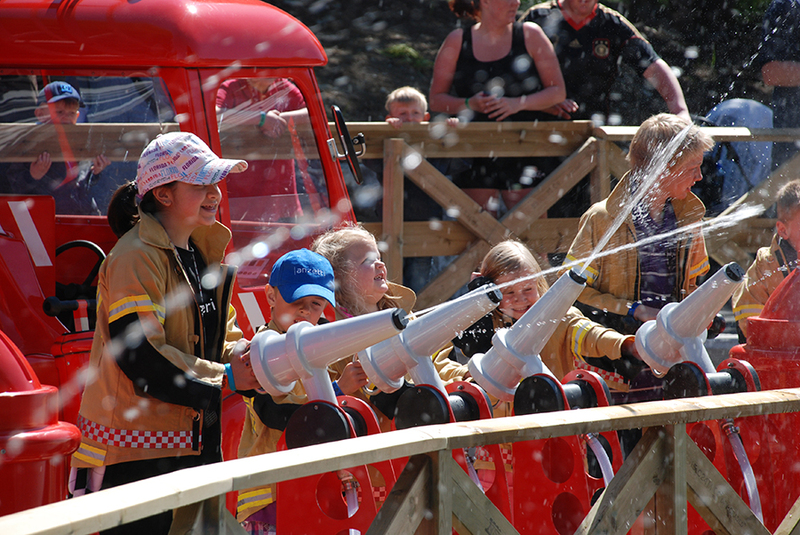 There, the children work as a team to pump the water, man the hoses and extinguish the fire. 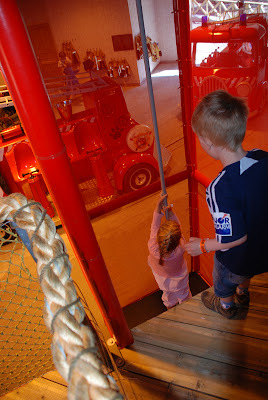 Their success earns them certificates of accomplishment and a home fire safety checklist (which can be submitted later for a gift from the attraction sponsor, a local insurance company). Parents watch as their children take on their roles with gusto. 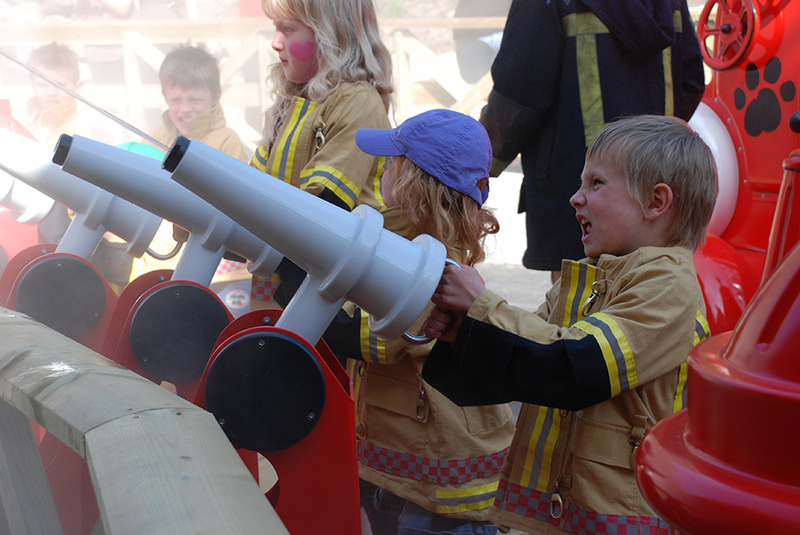 “For the parents it’s powerful – even cathartic - to observe their children’s earnest participation,” says Wiktor. 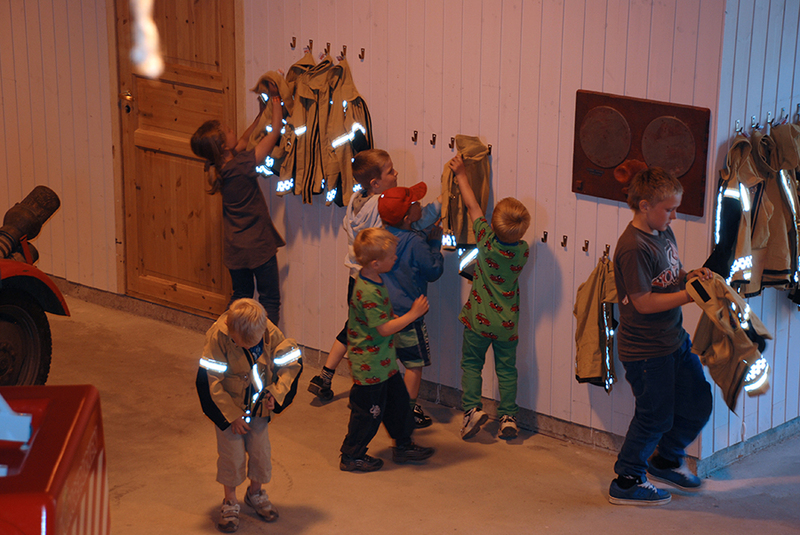 “The kids are very focused on the ‘grown-up’ tasks at hand.” Barnas Brannstasjon accommodates 30 children at a time. 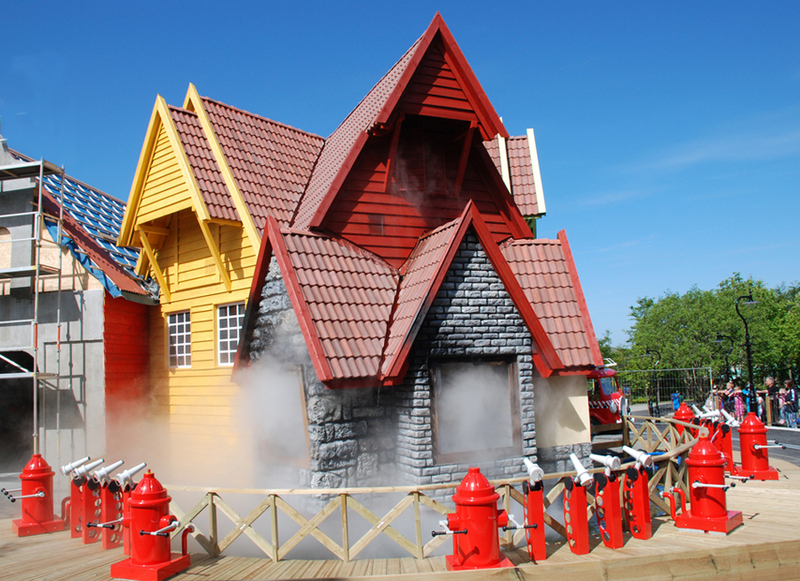 GW Group’s main role was to design and deliver the lighting, smoke, fire and water effects that help make Barnas Brannstasjon feel authentic, and to provide a control system that would be robust and simple for park staff to operate and maintain. It was a cross-continental endeavor: GW Group designed the effects and control package in the US with creative technical partners Visual Terrain (Lisa Green and Steve Young), Kool Fog (Brian Rowe), Sigma Services and Alcorn McBride (Tommy Bridges). Wiktor traveled to Kongeparken to manage installation and commissioning of the system. The $2.75 million budget included everything except land costs; Kongeparken used its in-house resources for facility design, construction, fabrication, AV and purchasing, with Lund as project manager and Wiktor providing some additional consulting. Kongeparken (www.kongeparken.no) is a seasonal, family-owned and -operated theme park in Stavanger, Norway. 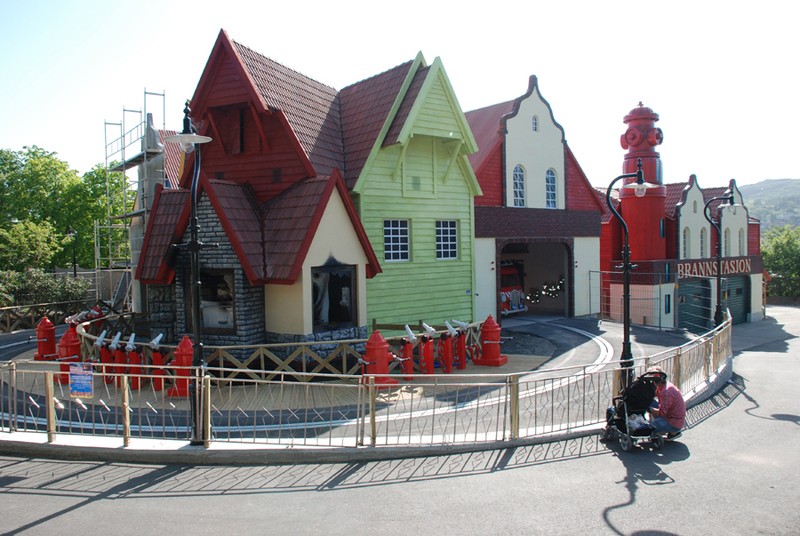 Among the 50-odd attractions at Kongeparken are a chocolate factory, numerous rides and shows, and 4 different themed areas. The park’s signature characters are Bamsekongen, the king (“konge”), Brumle the mischievous bear and Brumle’s girlfriend Brumleline. Kongeparken re-opens in winter for a popular series of Christmas events for families. George Wiktor of The GW Group is proud to have worked with The Hettema Group on Beyond All Boundaries, the immersive 4D educational experience created for the new Solomon Victory Theater in the National World War II Museum in New Orleans. On 16 November 2010, the Themed Entertainment Association named Beyond All Boundaries as the recipient of an Award for Outstanding Achievement. The Thea Awards are considered to be the highest honor of the visitor attractions industry, recognizing excellence in the creation of compelling places and experiences. The GW Group. Simple theme. Powered by Blogger.